Today I read an email from a reporter and thought to myself, "I'm done. I'm emotionally exhausted. I don't want to talk to anyone any more. I need to find someone who works in media relations who will help me draft a statement." I closed my computer and almost as the exact moment my phone rang. Out of nowhere, an old friend whose job is media relations was calling me. "Susan, I don't think I can do it any more. I'm so hurt. I'm so angry. I'm so confused. I want people to have the facts but I don't want to stir the pot. I don't think I should say anything else." "Bonnie, you don't have to listen to me, but I want you to know that if you do not tell your story, if you don't share your perspective, it will not be told. If you don't want to comment on the drama - don't! Think of what you want people to know and make that what you speak about." Friends, I don't want to stir the pot. I want Bishop Jenky to be able to reopen Fulton Sheen's cause, I want to see Fulton Sheen canonized, and I want it all to be done in a way that honors and glorifies God. I wholeheartedly believe that Bishop Jenky and the Sheen Foundation have done everything they have because they sincerely were trying to be forthright with their donors and the public and nothing else. A couple hours after my phone call with Susan I was praying about it all and a song came on the radio. I busted out laughing because just like Gwen Stafani was singing, this stuff really is bananas. B-a-n-a-n-a-s.
One of the reasons I truly believe that Fulton Sheen should be a saint is because of how he suffered. He suffered silently, confiding in only his closest friends. He didn't complain and he didn't grumble. He did not want to fan any flames of gossip or slander. Another reason I believe Sheen should be a saint is because he was a man of action. He spoke up; he spoke out; he spoke the truth. He called on people to send in their pennies, nickles, and dimes and by doing so he raised millions for he missions. Through my conversation with Susan and my prayer I've realized that it's one thing to share information and it's another to engage in comboxes and Facebook threads. I don't regret anything I've written but the time has come for me to step back from all of this. It's too personal, it's too close to my heart. However, I still encourage anyone who wants to help the cause to let your feelings be known. A reliable contact with connections in Rome suggested that we write to the Congregation for the Causes of Saints and to the Pope, that especially the Congregation would take notice if people cared. When a cause for canonization begins one of the things the author of the cause needs to prove to Rome is that people, the laity, actually care. The author, the bishop pursuing the cause, must show that the faithful believe the person to be a saint already and that they believe the person's life is worth emulating and that doing so will bring glory to God. I suppose that this letter writing campaign is an extension of the original proving to Rome that people care about Sheen's cause. And please, let's all agree that it's one thing to be upset with someone's actions but we should never slander. Poor Cardinal Dolan and poor Bishop Jenky. Thank you so much, Amanda. Prayers for His peace and His will. Don't worry, Bonnie... every sainthood has more than its fair share of challenges! I don't know the entire backstory, but seems like both NY and Peoria have Sheen relatives claiming that he belongs in one place or the other, so I'm guessing there's both a family and a Family squabble going on. God will sort it out in his time, and is probably waiting until your babies are old enough to make a trip to Rome for the canonization easier! 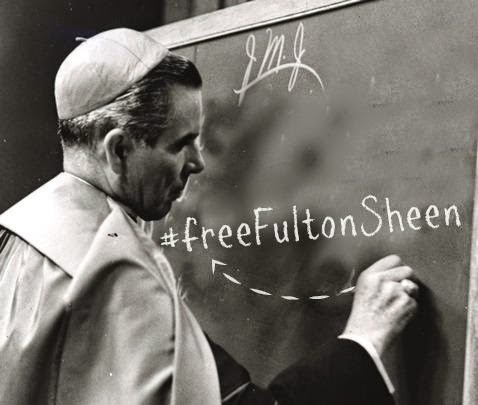 "I have been trying to balance these two parts of Venerable Fulton Sheen as I've tried to navigate through all my emotions, all the confusion, the half-truths, and misunderstandings." Bonnie, that sentence brought tears to my eyes; you are truly a blessing and a role model to me. To me, it's proof that you are truly devoted to Ven Sheen's cause and that he is worthy of our veneration! I'm saying prayers of peace for you and your family, and also prayers of thanksgiving that I was brought to your blog! Thank you for the prayers. I hope you keep coming to my blog. It was nice to "meet" you! Just wanted you to know that I've been thinking about you and your family. This is the stuff great Saint stories are made of (Fulton Sheen's and your's!) So sorry for your suffering, though. Prayers. Well said Bonnie. Sending my letter this week! I'm praying for you and your family, Bonnie. I've found this whole thing very distressing. But all in God's time. I don't know how much you've been reading online or if this would help you at all, but I read a really well-written article about it in Crisis Magazine by D. Prudlo...i thought it had a really refreshing perspective. Jill, thank you for telling me about that article. While I do not 100% agree with everything he said, his was the first article that gave me peace. After ALL the things I've read, his was the only one that seemed balanced, fair, and full of hope and trust. Oh Bonnie. This just makes me want to cry. I've given up social media for the month in spiritual baby 3rd prep, and now I'm so very grateful I did. I'm so sorry. I don't comment here much, but I'm really grateful for all your work in this cause, prayer and love. I'll be sending a letter- thank you for putting one together!- and praying for this cause. Much love and hugs from Colorado.